For MM7 connections, the “Server Address” field should contain a URL for posting to the MMSC. (The “http://” portion of the address is optional.) For example, http://192.168.1.1:8080/mm7. The “Login Name” and “Password” specify an optional login name and password that will be used to login to the MMSC using HTTP Basic Authentication. “VASP ID”, “VAS ID” and “Service Code” values are optional parameters that may or may not be required by the MM7 provider. Your provider should indicator whether or not these parameters are required. “Connection Type” should be “To MMSC (submit format)” if you are submitting messages to an operator or provider MMSC. 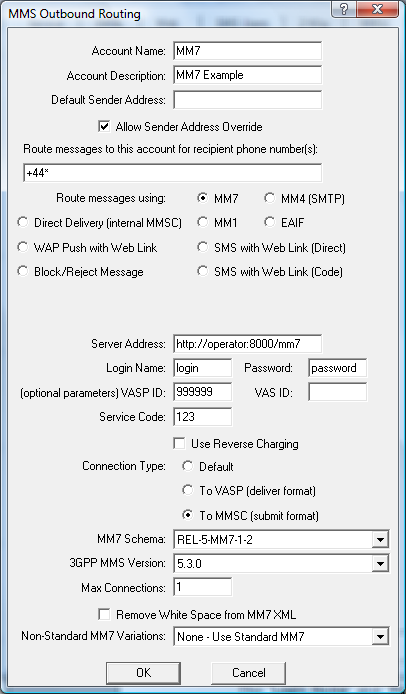 “Connection Type” should be “To VASP (deliver format)” if you are configuring an MM7 connection that delivers message to an application. “Non-Standard MM7 Variations” – This setting enables support for connecting to MMSCs that do not support the MM7 standard. NowSMS supports the non-standard MM7 variations deployed by Ericsson, Materna AnnyWay and LogicaCMG. Additionally, NowSMS supports an HTTP multipart file upload interface which can be useful for integrating with custom PHP scripts. This HTTP multipart file upload interface is described in more detail in Receiving MMS Messages with a PHP Script: HTTP File Upload Post.